Fair Winds Press, 9781592336333, 208pp. 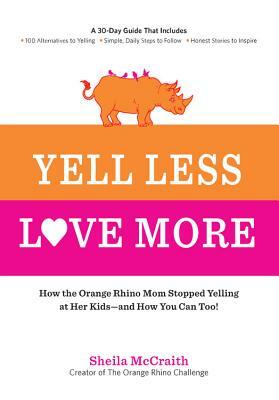 Sheila McCraith, also known as The Orange Rhino® (www.theorangerhino.com), is a mom to four boys, all under the age of 7. In January 2012, after her handyman caught her screaming at her boys, she made a promise that she would go 365 days straight without yelling at her kids. To chronicle her progress, keep herself accountable, and find support, Sheila launched her blog, The Orange Rhino Challenge®, shortly after her promise was made. She successfully met her goal in 2013 and continues to work everyday at yelling less and loving more. Sheila has been featured in Parents magazine, where she was the 2013 winner of “Blog Most Likely to Help You Achieve a Goal” and her article “10 Things I Learned When I Stopped Yelling at My Kids” instantly became a viral hit on The Huffington Post. She has also been featured on Babycenter.com, Mothering.com, Everydayfamily.com, Allparenting.com, Families.com, and more.